Not quite as adventurous as the first, but still tells an interesting thread of stories as the characters split up and go down different paths. The Two towers is a much darker movie than the first Lord of the Rings movie was. I suppose that’s a staple of trilogies these days, really going back to The Empire Strikes Back in the original Star Wars trilogy, and it tends to work. The first movie has to be bright and sunny to draw the audience in and introduce the world. And the final movie has to be happy and conclusive. But the second film is the one that can get really dark, knowing that it has a whole other movie ahead of it to patch things up. The Two Towers continues right where the first movie ended with the Fellowship now divided into three groups of characters. There are Frodo and Sam who have left the group to go to Mordor on their own, where they will drop the ring into the fiery pit of Mount Doom. Then there are Merry and Pippin who have been kidnapped by Uruk-Hai, the monster army that was created by evil Salimon in the first movie. 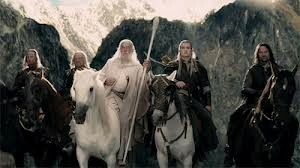 And finally, there’s Aaragorn, Legolas, and Gimli, the three unlikely friends, (a man, an elf, and a dwarf), trying to follow Merry and Pippin and rescue them from their kidnappers. All of this sounds like at the very most it would be two stories and not three because the Aaragorn story is directly related to the Merry and Pippin story who they are trying to rescue. But Merry and Pippin end up getting involved in their own thing with giant trees while Aaragorn and his company ride off to the city of Rohan to see what trouble lies there and what they can do about it, and just like that we have three very different stories, all unfolding at the same time. The division of stories doesn’t work nearly as well as the first movie which kept everyone together on the same mission, facing the same challenges. One might think that dividing it up could be a bonus because it leads to more stories instead of just one, but more stories means more problems. WIth one story, you just have to make sure that the story is interesting and compelling. With a bunch, you need to make sure every one of them is worthwhile, and most likely every one of them won’t be. In this movie, there are plenty of stories that move slow. Merry and Pippin in particular, riding around in a slow-talking tree for most of the movie just feels like it takes forever. Yes, the tree story ends in a very exciting place, but it sure did take a long time to get there. The Frodo and Sam story also tends to move slow despite the addition of a new creature to their pack, the hideous and deformed Gollum. Their story brings them to the black gates of Mordor just to have them turn around and try to go a different way and end up not getting anywhere close at all. Gollum is a hell of a CG creation and was state at the art at the time of this movie’s release, but that doesn’t take away from the fact that these characters aren’t going half as far as they went in the first movie, not to mention the right direction. Luckily Aaragorn’s story dominates the second half of the film. 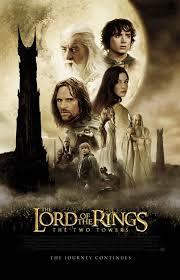 He’s got the big battle at Helms Deep which serves as the action climax of the movie. He’s the character who has always been the physical hero so far, and in The Fellowship of the Ring, it was he who fought off the Uruk-Hai leader as the final bad guy during the climax of that movie. Frodo has the ring mission, Aaragorn has the battle mission. And he delivers. In The Two Towers, Aaragorn has the best and most diverse story of anyone, first trying to track down Merry and Pippin, then meeting a surprise guest in the woods, and after that heading to the city of Rohan. Once in Rohan, Aaragorn watches as a poisoned king has a spell removed from his body. The King sits on his throne with his evil cackling, not unlike Jabba The Hut in Return of the Jedi. And like that movie, where the threat of Jabba was squashed early on, here too the King’s poisoning is taken care of in the first half to make way for bigger challenges up ahead. Just like the first movie, the second half of this film is where most of the real action is. The first half is about getting the characters moving in the right direction and setting things up for them and the second half is about cashing in on those setups. We get Aaragorn and his crew fighting off orcs who ride giant wolf-like beasts known as bog beasts. Then we get these guys going to Helms Deep to prepare for the film’s great battle. And we get to see that long battle in immense and complete detail. Also in the second half, there is an attack by an army of trees in the Merry and Pippin story and an attack on a fort of Gondor by some dragon-riding Ring Wrath’s (the hooded demons who now ride dragons instead of horses). The movie definitely picks up steam in it’s second half to give us all of this action, and the overall story is certainly compelling, but there are plenty of parts that just move too slowly. Gollum is an interesting character, but he is tortured way too much in this movie and his multiple personality disorder scene is just slightly better than when Willem Dafoe’s Green Goblin broke down in front of a mirror in the first Spider Man movie. The action is definitely great here and the Helms Deep Battle does just about everything right including taking it’s time and staying with it for a while. It’s a very good movie, but certainly slower-moving than the first film. The story hits some bumps, but the details and atmosphere are as strong as ever. The Helms Deep sequence is a marvel all on it’s own, and it’s the perfect climax to end this film with a bang.